2. 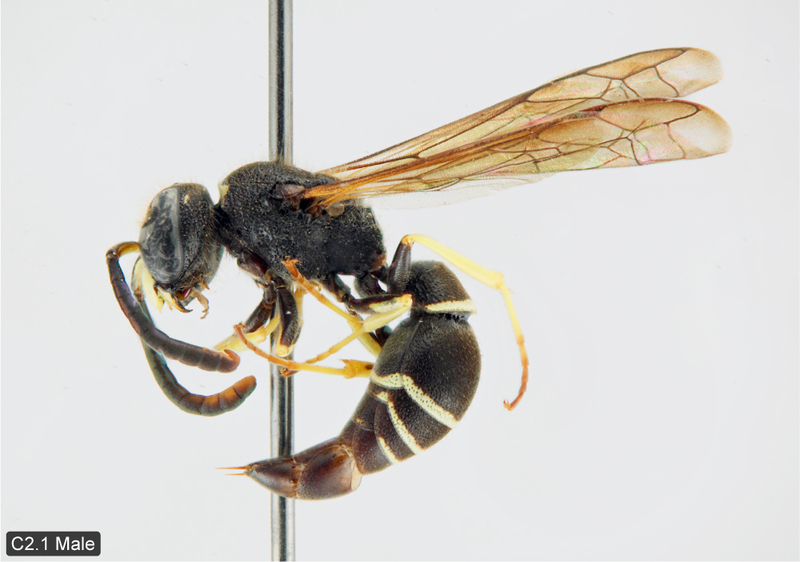 Ancistrocerus albolacteus Bequaert, 1944, stat. n.
Taxonomy. 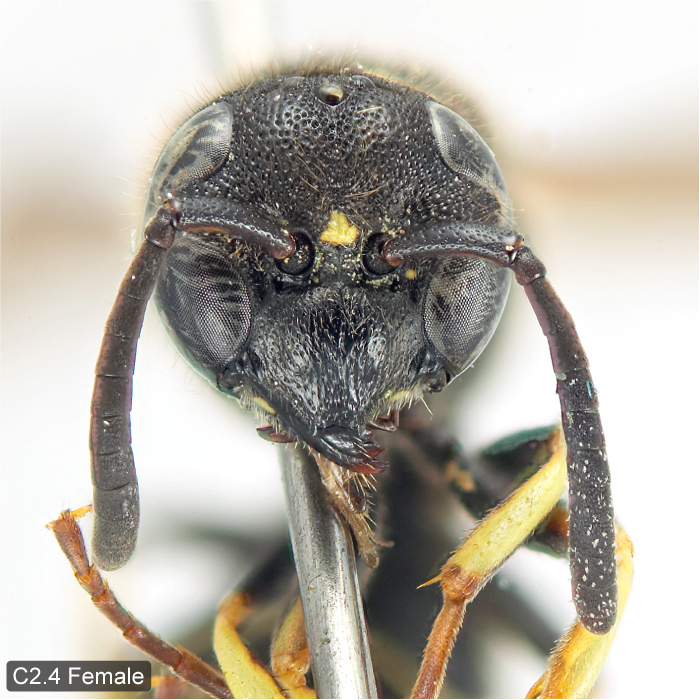 Ancistrocerus albolacteus was described as a variety or subspecies of A. adiabatus. 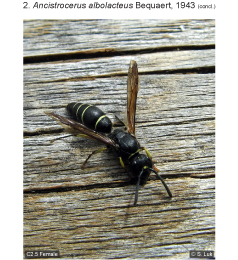 Morphologically the two species are almost identical except for the evenly micropubescent sternum 2 of the male (devoid of micropubescence medially in A. adiabatus). The sympatric occurrence of these taxa argues for species status for A. albolacteus. 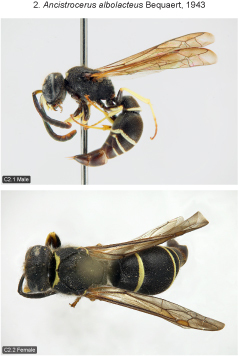 Both species occur in BC, AB, QC and NB but only in one case have we seen specimens from one and the same locality (6 ♂♂ A. adiabatus, 1 ♂, A. albolacteus, NB, Kouchibouguac Natl. Pk., Jul/Aug 1977, CNCI). Species recognition. This species has more restricted pale markings than A. adiabatus (especially the female), and the markings are usually paler (ivory instead of bright yellow). 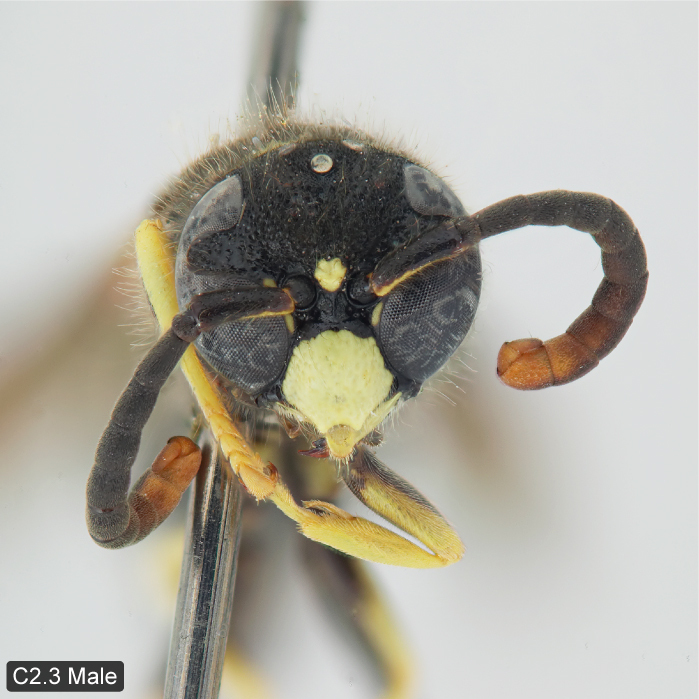 However some males of A. albolacteus from British Columbia have quite extensive pale markings similar to A. adiabatus and in rare cases the markings can be yellow. However, the pubescence of male sternum 2 and the extent and colour of female markings are reliable diagnostic characters (see key). Variation. Fore wing length 5.0–7.5 mm (♂♂), 6.0–8.5 mm (♀♀). Pale markings of body usually ivory, yellow in some males from British Columbia (e.g., 1 ♂, BC, Saanich Distr., CNCI). Female clypeus usually black, sometimes with a pair of small ventral spots. 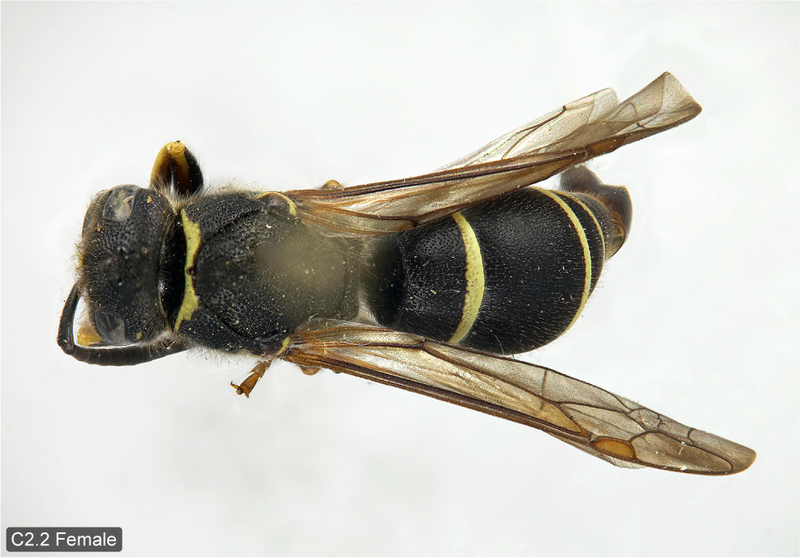 Male clypeus sometimes black dorsally, in one aberrant specimen mostly black except for a pair of confluent apical spots (1 ♂, BC, Kaslo; CNCI). Yellow spot along inner orbit of male usually interrupted opposite antenna, sometimes entire or restricted to level below antenna. 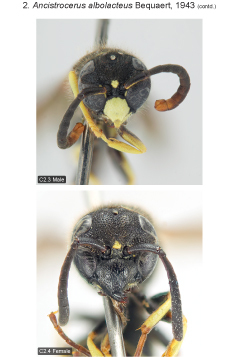 Yellow spot between inner orbit and antennal socket of female sometimes absent. 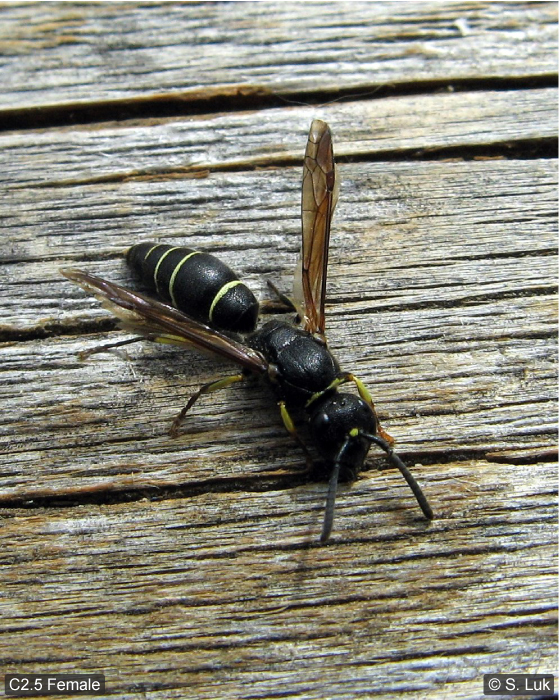 Spot on upper mesopleuron small or absent in female, sometimes present in males of yellow colour form. Tegula of male usually with restricted pale markings, sometimes more extensively marked or entirely black. Pair of pale scutellar spots absent or minute in female; rarely present in male (mostly in yellow colour form). Metanotum black or with small irregular pale spots, rarely with a pair of large spots or complete transverse band; metanotum exceptionally with pale spots in male. Metasomal terga 1–4 (female) or 1–(3)4(6) (male) fasciate, in female fascia of tergum 4 sometimes evanescent. Female sternum 2 with complete apical fascia; sternum 3 with pale apicolateral spots, rarely more or less connected by evanescent fascia. In male usually at least sternum 2 with apical fascia (rarely evanescent medially) and sternum 3 with apicolateral spots, in xanthic specimens sterna 1–6 with more or less complete apical fasciae (usually obscure on sternum 1 and on posterior sterna). Distribution. Canada: QC to BC (Krombein 1979) newly recorded from NB, LB and NT. We have not seen specimens or published records from ON, MB and SK but it must be assumed that the species occurs there. Western U.S.: AK, WA, OR, ID, MT, SD, CO and UT (Krombein 1979).